I love animals, like to watch them, but not in the zoo. I prefer to see wild animals in the wild. Of course not everything you can see in the wild, as sometimes it is not so easy to find them. But if there is possibility to do it I’ll do it. It is not so hard to spot kangaroos or wallabies in Australia. Koalas are not so widely populated as kangaroos and it needs more effort to see them. Closest place to Sydney I found was The Jean Shaw Reserve at Hawks Nest. I wasn’t lucky when I was visiting that place in hope to see koalas and locals were smiling asked about were I can find these animals. I understood I can’t expect to see them hanging on any tree in the town. Next place I hear is good for koalas spotting is in Victoria on Great Ocean Road. It is called as one of the best places in Australia to see koalas in the wild. There is parking on the side of the road (switch to satellite view and you’ll see cars parked there). Scroll along the road and may be you will see the same koala pictured in the above picture. When I was there I could spot 5-6 koalas eating, sleeping on trees. 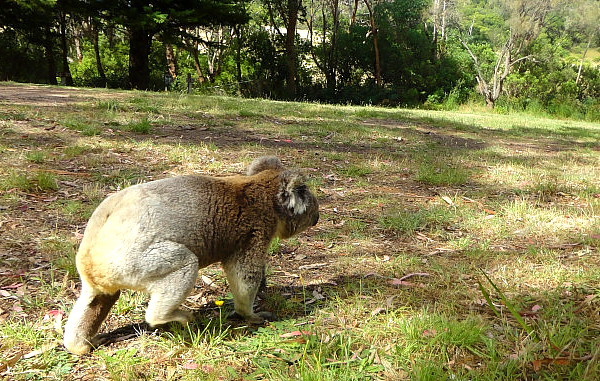 For the best chance of seeing some koalas, stay overnight at Bimbi Park. The park is about an hour away from the 12 Apostles, making it the perfect place to sleep after making the drive from Melbourne to see this natural wonder. At Bimbi Park, the koalas will come right up to your tent or cabin, making it one of the best places to see these animals up close and personal. Bob, where is exactly that island? Can’t find it on the google map. Also I heard there are a lot of wild life on Kangaroo Island, South of Adelaide, but hadn’t been there yet. we found kangaroos almost everywhere while we spotted heap of koalas along the Great Ocean Road especially on the road to Cape Otway sleeping on top of the eucalyptus’ trees and at Noosa National Park up in queensland, they are so cute! My apologies I got the name completely wrong, such is my poor memory! 🙂 Found it. Was looking to wrong border (SA/VIC) instead of VIC/NSW. Heaps of Koalas at Kennett River on the Great Ocean Road. You dont even need to get out of the car! We spent a couple hours on Raymond Island and saw tons of koalas. You can drive or walk around and they are right in the trees of people’s front yards! It was well worth the trip if you are in the Bairnsdale, VIC area. Annie, thanks for sharing. I passed by Bairnsdale on my way from Sydney to Melbourne, but didn’t know you can see koalas there. Australia is a beautiful country and I would like to explore it sometime. I always wanted to go on a nature adventure. These kind of wild creatures are very rare to see now a days. that’s why we need to focus and aware more on saving these, Koalas in one of them. Australia is a great country where you can see these koalas. Thanks mate for letting us know about the place where we see these beautiful creatures.